An e-book titled “Nigeria’s Olympics: Sports and National Development” has been launched to celebrate Nigeria’s biggest sporting triumph at the Olympic Games 20 years after. Co-edited by Lolade Adewuyi of football website Goal.com Nigeria and Tosin Adebisi of the University of Sussex, United Kingdom, the free book is a collection of 10 essays from a writing competition organised to celebrate the victory of the Dream Team at Atlanta ’96. The book was released at an awards ceremony to fete the winner and finalists of #WritingGamesNG on Thursday September 8, 2016. The essay competition, open to final year students in Nigerian higher institutions and National Youth Service Corps personnel, was won by Oladele Oluwasogo Dare, a National Youth Service Corps personnel based in Anambra State. The joint runners-up were Ekene Ezike, NYSC Osun State and Alfred Olajide, NYSC Taraba State. The third place was taken by Olumodeji Gabriel Shola, NYSC Anambra State. Orji Sunday Sylvester (University of Nigeria, Nsukka), Adewale Abiodun Sodiq (Adekunle Ajasin University, Akungba), Temitope Bakinde (NYSC Lagos) and Ikpebe Akpa Simon (Afe Babalola University, Ado Ekiti). “Words presently have failed me in expressing my heartfelt gratitude to everyone. You have successfully turned a near frustrating service year into a life changing story,” said Oladele, who went on an all-expenses paid trip to attend the 2016 Writivism Festival in Kampala, Uganda. The ceremony had in attendance Mr Dotun Coker of the Lagos State Football Association, who represented NFF 1st Vice President, Barrister Seyi Akinwunmi, and Mr Wale Joseph, deputy secretary general of the Sports Writers Association of Nigeria (SWAN) as well as Mr Seun Methowe, Perform Media Country Manager for West Africa. There was a high-powered delegation from the NYSC led by Mrs. Eno AwakEssien who represented the Director General, Brigadier General Sule Zakari Kazaure. Also in attendance was the Lagos State Coordinator of the NYSC, Mr. Cyril Akhaneme as well as several Assistant Directors. 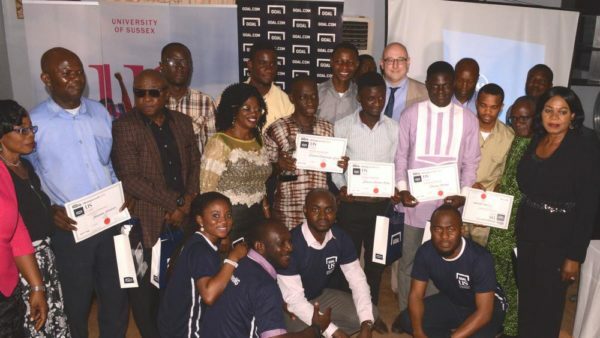 The competition’s judges – Professor Richard Follett of the University of Sussex and Professor Dipo Salami of the Obafemi Awolowo University – praised the effort of the entrants and encouraged them to continue developing their talent. They joined AIESEC Nigeria and the NYSC in celebrating youth development and empowerment across the country. The co-editors, Messrs Adewuyi and Adebisi, said they undertook the collaborative effort to bring synergy between sport and education as well as promote writing and a celebration of Nigeria’s heroic team of 1996. “We see this e-book as an important contribution to Nigerian sports and scholarship that needs to be encouraged in our country as a reminder of its important football heroes. The depth of writing which explored politics, culture, religion and sports point to how our country can succeed if we work as a team like the Dream Team of 1996,” the editors said in a statement. The winner was offered an internship and a trip to any part of the world by youth leadership organisation AIESEC who were one of the partners of the competition. The e-book can be downloaded free online via this link.